There are a number of options affecting all aspects of SIMetrix. Many of these may be viewed and adjusted using the Options dialog box, others can only be accessed from the command line using the Set and Unset commands. Undo Level Number of levels of schematic undo. See Creating a Schematic. 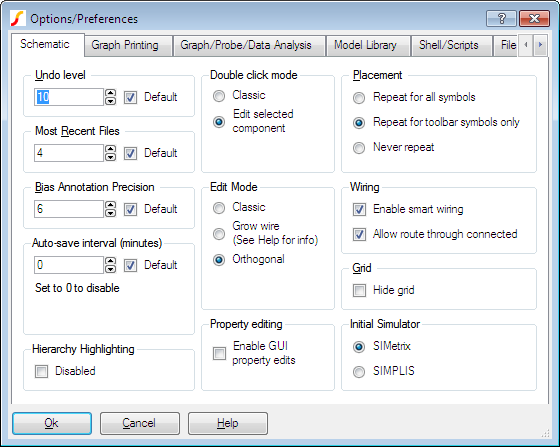 Bias Annotation Precision Controls the precision of the schematic voltage and current bias annotation markers. Auto-save interval (minutes) Enter a value to enable schematic auto-save. SIMetrix will automatically save a backup copy of your schematic at the interval specified. If SIMetrix aborts abnormally, perhaps due to a power failure, you will be prompted to recover the auto-saved schematic when you next start SIMetrix. Hierarchy Highlighting Check the Disabled box to disable highlighting through the hierarchy. With deep and complex hierarchies, net highlighting can be time-consuming. Checking this box will restrict highlighting to the current schematic only. Double click mode Selects action when double clicking a schematic instance. Select Classic to retain pre version 5.0 behaviour whereby double clicking always starts a new wire. Select Edit selected part for the default behaviour which is to invoke the device value editor. Property Editing Enable GUI Property Edits: If checked, allows property text (i.e. labels) to be moved using mouse actions. Labels themselves can be editted by double clicking. See Notes on Property Text Position before checking this option. Placement When to auto-repeat placement of schematic parts. If autorepeat is enabled, a new symbol to be placed is automatically displayed after each placement. This speeds the placement of many instances of the same device. Wiring Enable smart wiring enables the smart wiring algorithm. See Wiring for details about smart wiring. Allow route through connected is an option for the smart wiring algorithm that allows it select routes that pass through existing wires that are already connected to the source or target destinations. Grid Option to hide the schematic's grid. Initial Simulator This is only relevant for SIMetrix/SIMPLIS products. Sets the initial simulation mode when opening a new schematic. If most or all of your work is with SIMPLIS, check SIMPLIS. This will save time switching to SIMPLIS mode for all new schematics. Axis line width Width in mm of printed axis. Grid line width Width in mm of printed grid lines. Minor grid Width in mm of printed minor grid lines. Curve line width Width in mm of printed curves. Curve identification When printing on monochrome printers or if Use markers for colour is selected, curves are differentiated using different line styles (solid, dashed etc.) and marker shapes (circles, squares etc.). For a large number of curves both methods are used but for just a few you can use this option to state your preference. Prefer line styles printed curves will first be differentiated using line styles. Prefer curve markers Printed curves will first be differentiated using curve markers. Use markers for colour Even if printing to a colour printer, curves will still be printed using markers and variable line styles to differentiate them. They will also be printed in colour. This is useful when creating on-line documents (e.g. using Adobe Acrobat Distiller) which might subsequently be viewed on-line or printed out. Probe update times Plots created from fixed probes are updated on a regular basis. This controls how frequently and when it starts. Period: Update period in seconds. Start: Start delay in seconds. Fixed probe global options Default persistence: Sets the default persistence for fixed probes. This is number of curves from previous simulations that remain after a simulation. If set to 1, previous results are deleted. If set to zero all results are retained. Persistence can also be set individually for each probe. See Probe Options Sheet for details. Curve weight Thickness of displayed curves. Curves display much quicker if this value is set to 1 but are clearer (but can lose detail) if set to 2. Digital Axis Height Sets height of axes (in mm) used to plot digital traces. Min grid height When a grid is added to a graph window, existing grids are reduced in height to accommodate the new one. But they won't be reduced to a height lower than specified by this setting. When this limit is reached, the vertical space will be increased by allowing the window to scroll. Temporary data file delete Simulation data is stored in data files that are placed in the temporary data directory (see file locations below). These options control when these data files are deleted. Never Temporary files are never deleted but will be overwritten in subsequent sessions. Not recommended unless you only ever do short simulations. When SIMetrix starts All temporary files are deleted when SIMetrix starts. When data is no longer needed This is the most aggressive delete method and is recommended if you do many long runs or/and have limited disc space. By default, the 3 most recent runs are kept but with the other options above, the data files are not deleted when the data is not needed but links to the data in them are released. (See explanation below). If this option is set, the data files are deleted as soon as they become out of date, optimising use of disc space at the expense of not being able to recover old data. Graph placement Specifies how new graph sheets are created. Stepped Displays a flat line for the width of each bin. Similar to a bar graph. Smooth Joins the centre of each bin with a straight line to display a continuous curve. Cursor readout Controls where cursor values are displayed. On graph Values are displayed on the graph itself. Status bar Values are displayed in status bar boxes at the bottom of the graph window. Both Displayed in both locations as described above. Simulation data is stored in temporary data files as explained above. The data is not read into system memory until it is needed - say - to plot a graph. However, the location in the file of the various vectors is always in memory so that the data can be extracted from the file as rapidly as possible. It is this latter location data that is destroyed when a simulation run gets out of date. The file containing the data gets deleted at a time set by the above options, not necessarily when the data is no longer needed. As long as the file exists, the data can be recovered by calling File > Data > Load... or File > Data > Load Temporary Data... which re builds the location data. Library Diagnostics Determines whether messages are displayed when models are found in the library. Abort simulation an error will be raised and the simulation will be aborted. Issue warning a warning message will be output to the list file but the simulation will continue normally. Ignore no warning or error will be raised and the simulation will continue normally. Echo all messages If set, all script lines will be displayed in the message window. This will result in a great deal of output and will slow down the whole program operation. Only set this if you are debugging your own scripts. Don't abort scripts on error Normally scripts abort if an error is detected. Check this box to disable this behaviour. Locations in your files system of various files and folders needed for correct operation of SIMetrix. Built-in Scripts This is the first location that SIMetrix searches for scripts. Much of the user interface is implemented with scripts and these are all internal to the program. These can be overridden by placing scripts of the same name at this location. This allows modification of the UI. Changing this setting has no effect until you restart SIMetrix. Scripts Location of script directory. This directory is searched for any scripts you run. Only change this setting if you are actually moving the script directory. Changing this setting has no effect until you restart SIMetrix. Start up Current working directory on start up. Start up Script Name of script that is automatically run on startup. You can place custom menu or key definitions in this file. System Symbols Location Directory location where the standard symbols are located. Temp Data Location of temporary simulation data files. Changing this setting has no effect until you restart SIMetrix. Note that this should always be a local directory. That is, it must not be on a remote network partition. User Symbols Location Directory where user symbol libraries are expected to be located. Note, you can place symbol libraries anywhere. This directory is simply a location that some UI functions use as a default. Defines extensions used for the various files used by SIMetrix. These setting control what file extensions are listed for editors of the various file types and, where relevant, what action will be taken if a file of that type is dragged and dropped into the SIMetrix environment. Many SIMetrix file types use five letter extensions beginning with .sx. This is to help prevent clashes with other applications. For each setting, the supported extensions are separated by a semi-colon. The first in the list is the default. So, for example, the default schematic extension is sxsch so when you save a schematic without giving an extension, it will automatically be given the extension sxsch. Schematic Files Extensions used for schematic files. Data Files Extensions used for simulation data files. Text files Supported extensions for text files. Symbol Files Extension used for binary schematic symbol files. This is used by the drag and drop system to detect Symbol Library files being dropped into the command shell. Logic Def. Files Files used for logic definitions for the digital simulator's arbitrary logic block. If the extension is omitted in the model (FILE parameter) this will be used. Scripts Default extension for scripts if called without an extension. Device models SPICE model files. Used by drag and drop system to detect model file types. Note the drag and drop system will detect model files with extensions not in this list and it is not usually necessary to specify model file types here. Netlist Files Files used for simulation netlists. Schematic Components Extensions used by schematic component files. Verilog-A Files Verilog-A Source files. Verilog-HDL Files Verilog-HDL Source files. Defines colour syntax highlighting for the various text editors. Defines colours for various UI elements. Note that schematic elements are defined using schematic styles. Curves Curve colours are chosen using a sequence number. The first curve on a sheet uses sequence 1, the second sequence 2 etc. New curves use the first unused sequence number. The colours associated with each sequence number can be defined here. All options have a name and many also have a value. These are set using the Set command and can be cleared with Unset. When an option is cleared it is restored to its default value. A complete listing of available options with possible values is given below. Note that option settings are persistent. This means that their values are stored either in the .INI file or in the system registry (see Configuration Settings) and automatically restored at the start of each subsequent SIMetrix session. Upper and lower case letters have been used for the option names in the following listing only for clarity. Option names and their values are not in fact case sensitive. Many of the options described below are supported by the Options dialog box in which case they are noted accordingly. Some options in the following list are marked as 'unsupported'. This means that they may be withdrawn in the future or their functionality changed. 700Extensions Boolean Schematic symbols for the 700 series semi-custom arrays are enabled if this is set. AllowTempDataDrives String List of drives separated by commas which are allowed to be used for simulation data without triggering a warning message. Drive should be specified with ':' suffix - e.g Y:. A warning message will be issued for any drive that is reported as connected through a network if used for simulation data storage. Only use this setting to override drives that are reported as network drives but in fact are connected locally. Only effective if AutoWireEnabled is False. CursorDisplay Text Default = Graph. Controls initial graph cursor readout display. In the simulator, any node name found in a subcircuit that starts with a '#' accesses a top level node of the same name but without the '#'. E.g. #VCC in a subcircuit connects to VCC at the top level. If this option is set, the '#' is not stripped, so #VCC in a subcircuit connects to #VCC at the top level. Affects network licenses only. If set, the license checkout process may take longer delaying the time it takes SIMetrix to start. It is not usual to need to set this option. Simulation data is buffered for performance reasons but this buffering can interfere with the incremental updates needed for fixed probes. Usually SIMetrix deals with this problem automatically but this is not guaranteed to work in all cases. In such situations, fixed probes or .GRAPH statements may not incrementally update correctly. Setting this option may rectify this. The following options set default file extensions. See Options dialog for more details. The buttons displayed on each of the standard toolbars are defined with an option variable - that is one for each toolbar. The value of the option consists of a series of semi-colon delimited button names. A complete list of button names and full information concerning user defined toolbars can be found in the Script Reference Manual/Applications/Creating Modifying Toolbars. The toolbar option variable names are listed below.